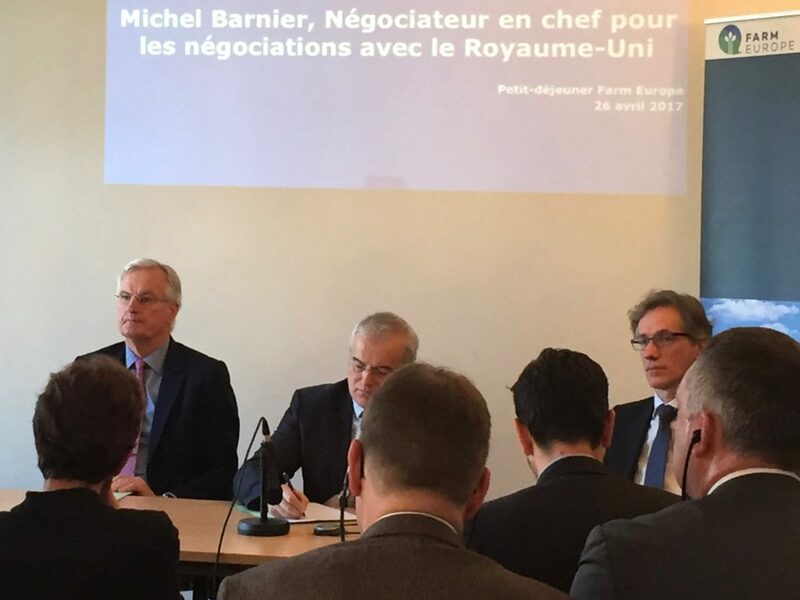 Michel Barnier, the European Commission lead Brexit negotiator, participated today in a breakfast-debate in Farm Europe on the challenges of Brexit to the EU at large, and in particular to the EU agri-food sector. As highlighted in Farm Europe’s report, Brexit will have a powerful impact on the EU agri-food sector, under any of the possible outcomes. That impact could be catastrophic in a no-agreement scenario. To grasp the relevance of Brexit to the agri-food sector it is worth reminding that currently the EU 27 enjoys a large trade surplus vis-a-is the UK in excess of 20 billion euros per year. Under a scenario where the outcome of the Brexit negotiations is favourable to a long-lasting trade relationship between the EU 27 and the UK, under a comprehensive Free Trade Agreement (FTA), the EU 27 will continue to benefit from a tariff-free access to the UK market for most of its agri-food exports. However the EU 27 will face new and increased competition from all the other countries with which the UK will also strike Free Trade Agreements. It is indeed very likely that the UK will pursue FTAs with key world players, like the US and members of the Commonwealth, which are world-class producers of agriculture and food products. In particular the beef, dairy and wine EU sectors would face severe headwinds from these new competitors who would benefit from the same conditions of access to the UK market as the EU 27. The negative impact could be even stronger as the UK could become a platform for exporting products from these countries to the EU 27, benefiting from the free trade provisions of the EU 27-UK FTA. That could be case for sugar products, using the UK refining capacity on sugar cane imports, and for many other products if appropriate safeguards are not put in place. Rules of origin must be tightened to prevent a massive diversion of agri-industrial capacity from the EU to the UK on the back of access to cheaper raw materials and to the single market. However, if the Brexit negotiations fail to produce agreement on the future trade relationship, the EU 27 would face a tariff barrier on its exports to the UK identical to what third countries face today in exporting to the EU. The tariff level in agri-food products is substantially higher than in other sectors, and particularly high in meat and dairy products. If as expected the UK would sign new FTAs with other countries, that scenario would spell the end of EU agri-food exports to the UK on a number of key sectors and cause severe disruption of trade across the board. Not to mention the difficulties that would arise from the absence of agreement on rules and standards, and the lack of equivalency agreements, which would compound the negative effects of high tariffs. In any case Brexit will not only bring about a 3 billion euro net cut to the CAP budget, and also the EU 27 agri-food sector will suffer from Brexit under any scenario. It is thus urgent that the Commission devises a specific set of measures to anticipate the inevitable negative impact of Brexit to the EU agri-food sector. Resources should be mobilized from now on to promote EU 27 products in the UK and minimize the foreseeable impact of renewed competition from world players. The shape and the resources allocated to the new CAP should fully take into account the negative impact of Brexit in the sector. The EU agri-food sector fully understands the importance of a suitable result of the Brexit negotiations for the future of the Union. But it is equally important that EU negotiators and decision-makers understand the high-stakes of Brexit for the future of farming and of a food sector that represents 15% of the EU GDP.